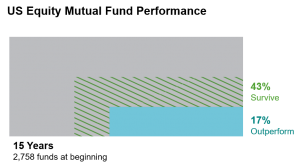 Park + Elm Investing Principle #3: Resist Chasing Past Performance! Principle #3 is HERE! If you missed #1 and #2…YOU’RE IN LUCK! Some investors select mutual funds based on past returns. However, funds that have outperformed in the past do not always persist as winners. The most important guideline to remember is: If a fund does not fit into your overall investment strategy, it’s a dangerous choice no matter how it’s performed in the recent past. Investors have a tendency to weight recent events more heavily than history. It’s nearly impossible for the typical investor to choose a fund that had negative returns in the previous year. Yet that fund, historically, may have proven to be an outperformer in its category. And the largest hurdle is that most investors don’t even think they are chasing performance. Research shows, however, that nearly every mutual fund outperforms individual investors in the fund. Every investor should have a disciplined investing strategy and stick to it, through bull and bear markets. A relationship with a professional financial advisor is the first step to developing this strategy, and it insures that you’ll take the right actions at the right time. 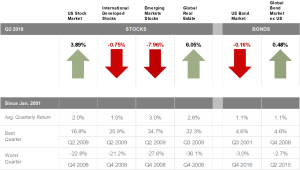 Rebalancing your portfolio will keep you from buying high and selling low. Investors who chase returns, are adding to a piece of the investment pie that’s already too big. If you rebalance your portfolio once a year, you’ll be insured that you’re adding to the smaller piece of the pie, and inherently buying low and selling high. Don’t be tempted to pull your investments from the market when it falls. These are the most opportune times to increase long-term returns through rebalancing. Your personal goals should drive your investing strategy. Keep that in the front of your mind and it will be much easier to remain disciplined. Remember, past performance alone provides little insight into a fund’s ability to outperform in the future. A more disciplined approach has proven to be the best way to increase-long term performance. INTERESTED IN THE REST OF THE INVESTING PRINCIPLES? DOWNLOAD OUR EBOOK HERE! Investing for Retirement Principle #2: Don’t Try to Outguess the Market! Download our Ebook Here to get all 10 principles!! The market’s pricing power works against mutual fund managers who try to outsmart other participants through stock picking or market timing. As evidence, only 17% of US equity mutual funds have survived and outperformed their benchmarks over the past 15 years. Even so, traditional investment approaches strive to beat the market by taking advantage of pricing “mistakes” and attempting to predict the future. Too often, these approaches prove costly and futile. Predictions go awry and managers may hold the wrong securities at the wrong time, missing the strong returns that markets can provide. Meanwhile, capital-based economies thrive—not because markets fail but because they succeed. What if the typical investor decided not to bet their life savings on tips and hunches? We know from our first piece in this series, that trying to guess the most underpriced stocks is betting against 98.6 Million other investors each day; and that equity prices are fair and efficient. We also know that markets throughout the world have a history of rewarding investors for supplied capital. 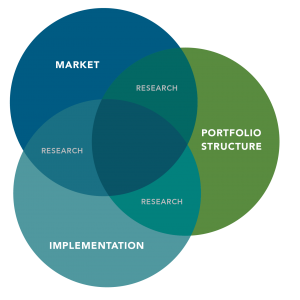 Instead of guessing, we should lean on academics and science to guide the way to designing a portfolio that delivers what the markets offer. A financial plan based on the science of investing frees you to focus on what matters – diversification, lowering costs, and discipline. Many of the greatest advancements in Finance have come from academia and research. 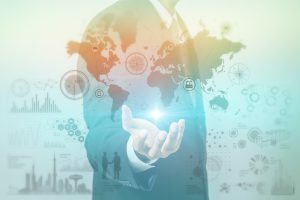 Academic research has identified the sources of investment returns historically, and applying academic insights to practical strategies can help investors benefit from what the capital markets have to offer. There is a different way to invest. We should think about why we invest, what we know from research, and apply proven scientific methods of expected returns to our portfolio design. We focus on gaining insights about markets and returns from academic research, reducing expenses, rebalancing, and taking on an acceptable amount of risk based on scientific dimensions of expected returns. Let markets work for you by taking advantage of sensible, well-diversified, low-cost portfolios backed by decades of research and practical experience. Park + Elm Investment Advisers, LLC is a Registered Investment Advisor offering Investment Advisory Services. The custodian for our client’s funds is The Charles Schwab Corporation. Park + Elm Investment Advisers, LLC is not affiliated with The Charles Schwab Corporation. We are registered with the Indiana Secretary of State Securities Division and additional information about us can be found on our ADV at http://www.adviserinfo.sec.gov/. The information in the brochure has not been approved, verified, or otherwise endorsed by the SEC or by any state securities authority. The brochure is for informational purposes only. It is not to be construed as tax, legal, or investment advice. Two-thirds of the small cap manager universe have failed to outperform the S&P Small Cap 600 Index. Across the thirteen fixed income fund categories, all but one experienced at least a 70% rate of underperformance over five years. …and the underperformance rate increases over longer periods of time. Most investors have investment time horizons much broader than 5 years, so trying to anticipate market movements over decades adds extreme anxiety and undue risk, while drastically increasing management expenses. Although the promise of above-market returns is alluring, investors must face the reality that as a group, US-based active managers do not consistently deliver on this promise, and they charge significantly higher fees for this underperformance. Consider the assumption that the price of a security reflects all available information, and the intense competition among market participants drives prices to fair value. This type of strong belief in markets frees us to think and act differently about investing. When you try to outwit the market, you compete with the collective knowledge of millions of investors. By harnessing the Market’s power, you can put their knowledge to work in your portfolio. Markets throughout the world have a history of rewarding investors for the capital they supply, and persistent differences in average portfolio returns are explained by differences in average risk. Attempting to time the market creates periods of time when investors are out of the market. This lack of participation can prove very costly to long-term returns. 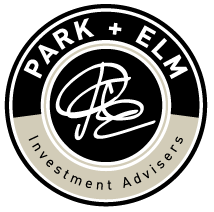 At Park and Elm, we embrace the market, and put investors in a position to capture returns from market growth over time, by pinpointing an acceptable level of risk, for an acceptable long-term return. 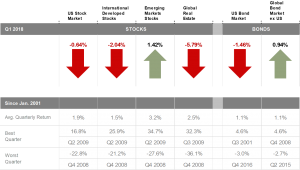 There are periods of good and bad in the stock market, but it is by far the BEST investment option we have. Understanding that the price of a stock is driven to fair value by the intense competition of companies and investors, allows us to focus on controlling risk, lowering fees and diversifying into the broader markets. Over long periods of time, investors can benefit from consistent exposure in their portfolios to both U.S. and non-U.S. equities – large and small; value and growth. 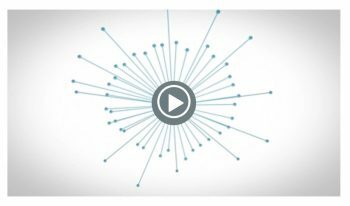 Check out this short video with Dimensional’s Joel Hefner explaining how diversifying globally and emphasizing the dimensions of higher expected returns can improve the chances of having a successful investment experience. The Stock Market Sell Off…Will it Continue? The U.S. stock market sell-off continued Monday with the Dow Jones Industrial Average suffering its biggest one-day point drop in history, plunging 1,175 points. The market gave back its 2018 gains as a flash-crash-style drop intensified a free fall in stocks that began last week. That leaves many investors worried and wondering what to do. Our firm is watching this situation very closely for our clients. The stock market is still in midst of a 9-year bull market. The S&P 500 spent the last 200+ days within 3% of all-time highs with no correction and gained over 22% in 2017. Since President Trump was elected in November 2016, the DJIA has gained 45%, through its record closing high on January 26, 2018. It’s important to remember that stocks will not go up forever. Markets go up and down and this may be our wakeup call after 14 moths of gains. Most analysts consider this drop to be a normal correction, as opposed to a sign of a bear market. Many market watchers remained baffled about what prompted the sell-off since there was no major economic news or earnings reports from major companies on Monday. Increase in interest rates – The 10-year Treasury bond yield rose to 2.85% on Monday, from 2.40% at the end of 2017. Rising rates can put pressure on stocks. Inflation – There is a fear of spiking inflation, which can give cause for possible future rate increases. Wage increases, while good for the economy, can also attribute to an inflationary environment. Bitcoin – The virtual currency has fallen from a high of $20,000 to less than $7,000. This does not correlate directly with stocks, but can create an environment of negative sentiment for investors that have lost money in this asset class. HFT – Some of the late selling on Monday can be attributed to HFT (high frequency trading). 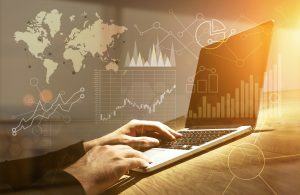 HFT is an automated trading platform used by large investment banks, hedge funds and institutional investors which utilize powerful computers to transact a large number of orders at high speeds. These computers using algorithms to put in sell order. Many orders hitting at once can magnify a sell-off. Most likely, no action is needed. Focus on why you are investing and your long-term goals. We will work with our clients to make sure the current asset allocation (stocks verse bonds/cash) meets their risk tolerance. Rebalance your portfolio when needed to bring back into alignment with the long-term plan. Keep investment costs low and stay diversified. Our firm keeps the above principles at the forefront of our investment philosophy so our clients will be positioned well in volatile times. If you have any questions on your specific situation, please feel free to contact our office.